The title might seem like an odd combo, but bear with me here…it is all connected, at least to me with this newest outfit. 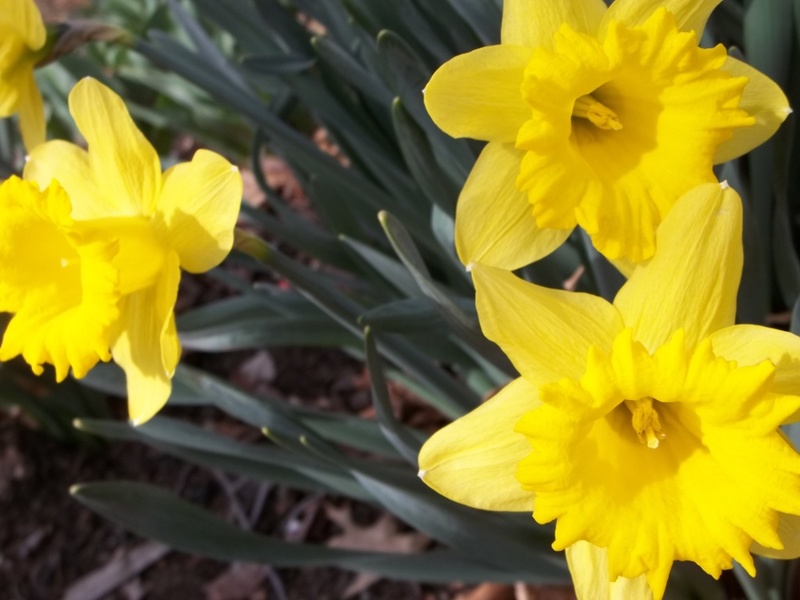 In this post, I’ll proudly reveal myself to be a big fan for the decade of the 70s and its amusements – something that many vintage bloggers as well as those who lived in that decade seem to generally not share in common with me. As one who is at the age to have totally missed that era, I can feel a connection to the decade of disco music, pinball machines, bell-bottom pants with platform shoes, and Star Wars because all these things played a big part in my parents’ lives. What they were “in to”, I saw in old pictures, records in the basement, and clothes or memorabilia in a forgotten closet – and all that was cool and interesting to me. Parents are interesting anyway, right? Reasons given, I’ll move onto what I actually made. NOTIONS: I only used what thread, interfacing, and other notions from on hand. The pants button came from the stash of Hubby’s Grandmother so it might be vintage. I only bought a metal jeans zipper for the pants. THE INSIDES: Most seams are bias bound on the vest, the pants edges are left raw, and the jacket seams are covered by the lining. TIME TO COMPLETE: The vest was finished first on November 21 after only 3 or 4 hours, the knit jeans came second being finished on November 22 after 3 or 4 hours, and finally the jacket was done on November 28, 2016, after about 15 hours. TOTAL COST: The denim knit was something I bought about 5 years back so I don’t remember where it came from or how much I spent for it. All of the rest of the material for this outfit was bought about 2 years back when there was a Hancock Fabrics store closing, so it was incredibly dirt cheap. 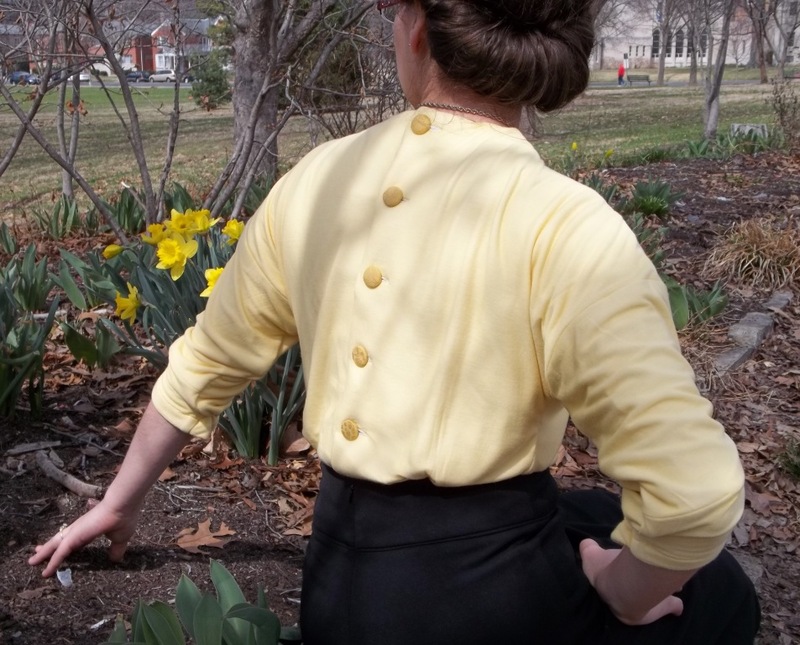 In all, not much fabric was used here – 2 yards of each fabric, except for ½ yard of the vest sweater knit, and voila! Look what I came up with! 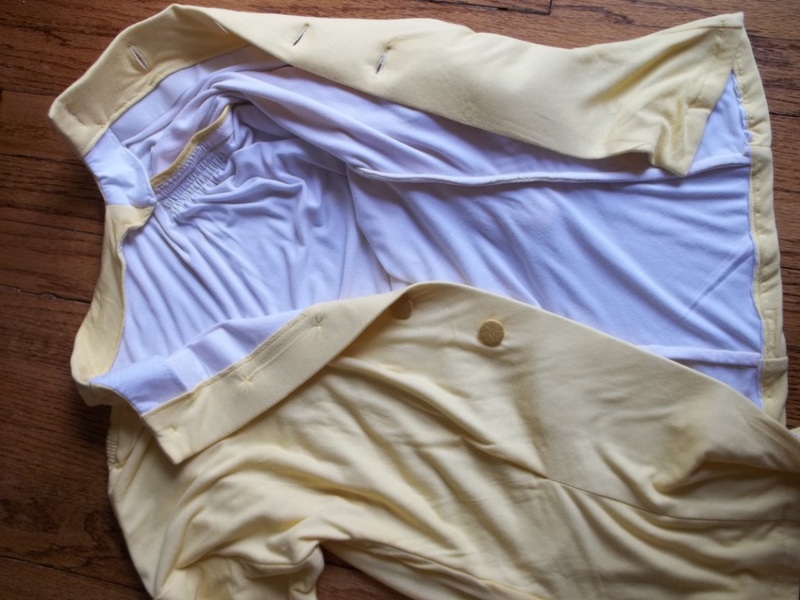 I won’t bore you too much detail in this post about sewing and construction details because not only are there three me-made garments here, but also one of them was tricky and complicated (the jacket) while the other two (vest and pants) were super easy. I must say I am very pleased with all the patterns, especially the vest and pants. The jacket is great, too, don’t get me wrong, and surprisingly warm for being a not-too-heavy of a weight. My only reserve is that I am doubtful whether or not I paired the right fabric (the vinyl) and pattern together. 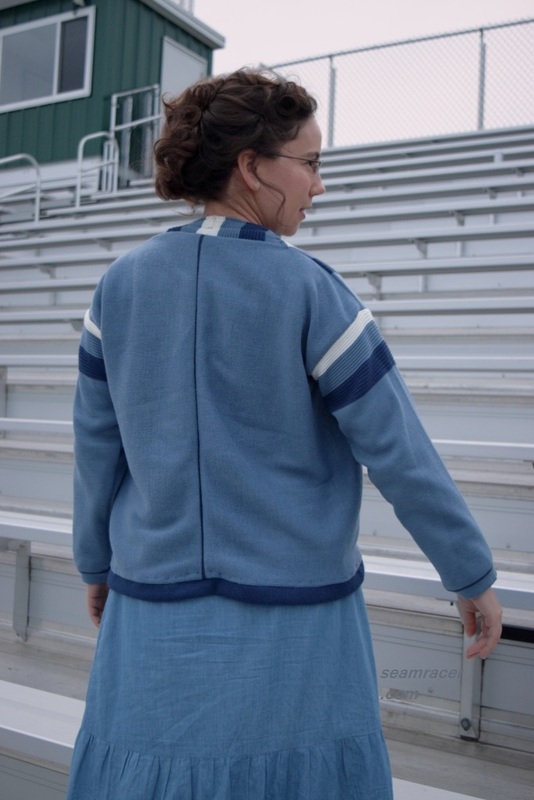 My hubby makes me feel better by saying that the material would have been hard to work with (and it was) no matter what pattern I’d have chosen, but this style is uniquely neat especially with the raglan sleeves. The vest is more of a novelty item, but I am realizing it will go with more than what I first thought, mostly because I like it so much! However, one can never beat an easy creation that looks so good and fits so great, so the jeans are the ultimate winner, especially for being so basic and versatile. I will go over each item briefly to comment of the fit and anything I changed. First comes the vest. 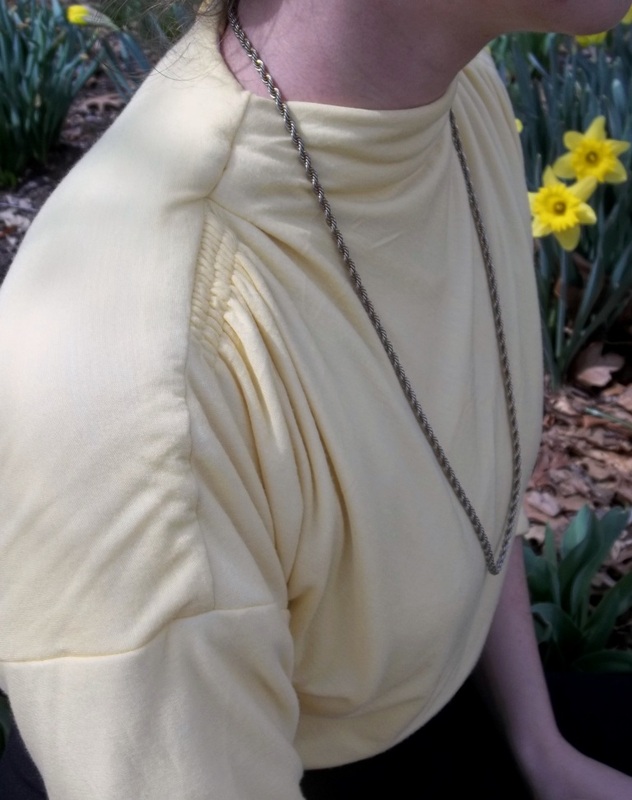 I made a straight size small and found that I should have graded a size up for the hips the same way as I do for regular garments such as blouses and dresses. 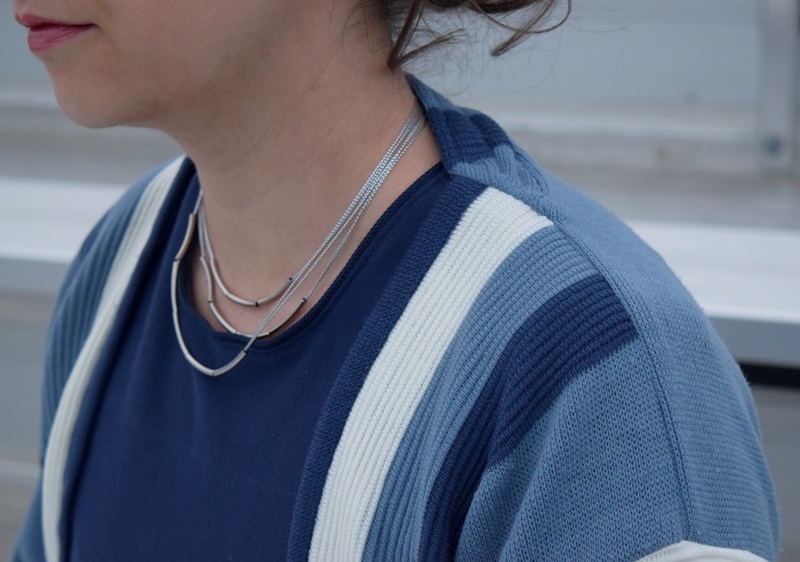 The neckline of the draping were taken in by an extra inch to make for less of a droopy wrap, purely personal taste. 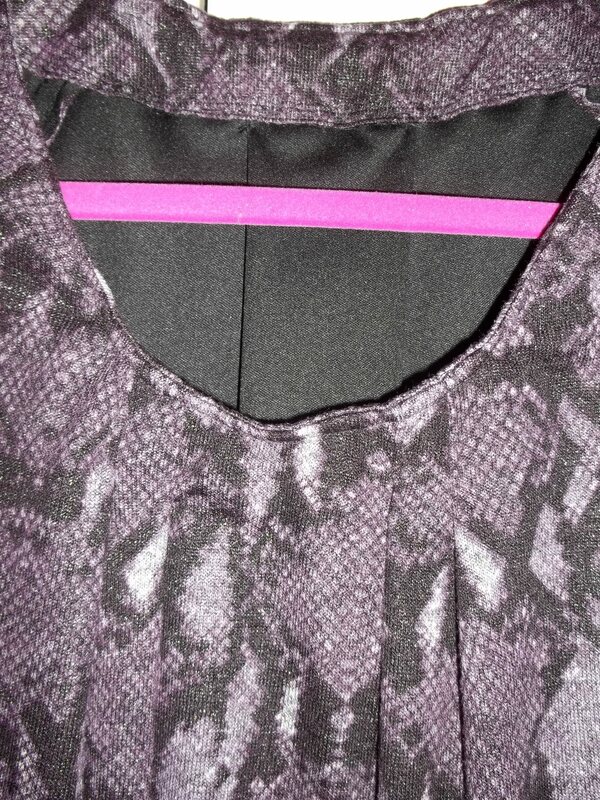 A facing of the micro suede used for the back was drafted from the pattern for the neckline edge. 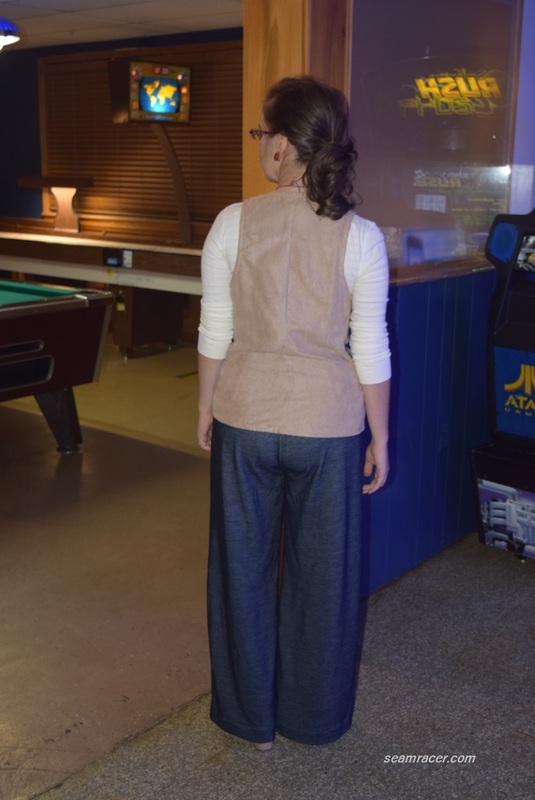 I found the back of the vest to be quite long, ending at the bottom of my behind…not flattering. So, to vent my frustration waiting for our Thanksgiving guests to arrive, I unpicked the bottom hem and re-sewed it 2 inches shorter in the back of the vest. I love the texture and interest of this vest, besides the fact it is a wonderful weight to wear. It keeps a chill out of my middle but yet the lack of sleeves keeps me from over-heating inside stores and homes. I’ve always associated vests with the outdated 80’s things (like boxy front-halves of a weskit) that I wouldn’t be caught dead in, but now that I have a fashionable vest, I may have to re-think the value of this kind of garment for winter layering. 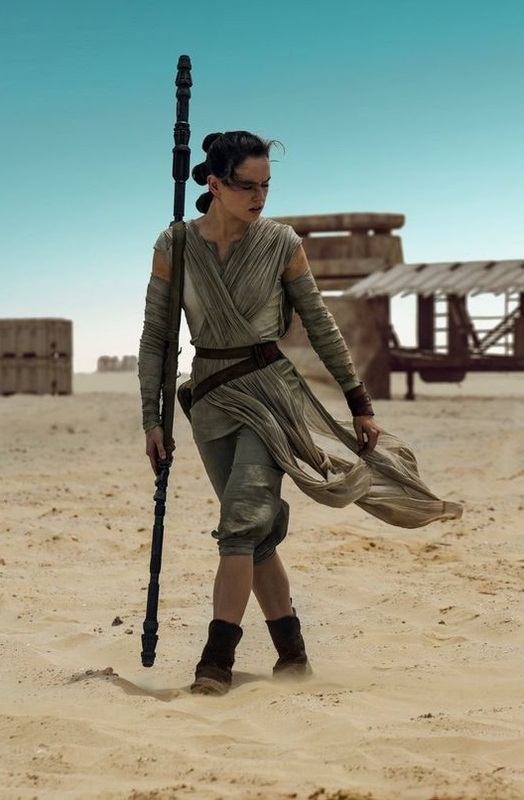 The funny thing is, this vest made in this desert sand khaki color, with its rough texture, and criss-cross design totally reminds me of the outfit for the lead character “Rey” in the 2015 Star Wars movie, “The Force Awakens”. I know it’s not exactly the same thing but I believe you can definitely tell where I see similarities. This vest, though modern, also reminds of the creative and interesting, bold but relaxed style that see in 1970’s dressing. My idea to whip up the pants was spawned of all my ideas from and of the vest. All of my previous pants have all been made of woven fabrics so I went for a thick denim knit sitting all lonely and forgotten in my stash for the last 5 years. 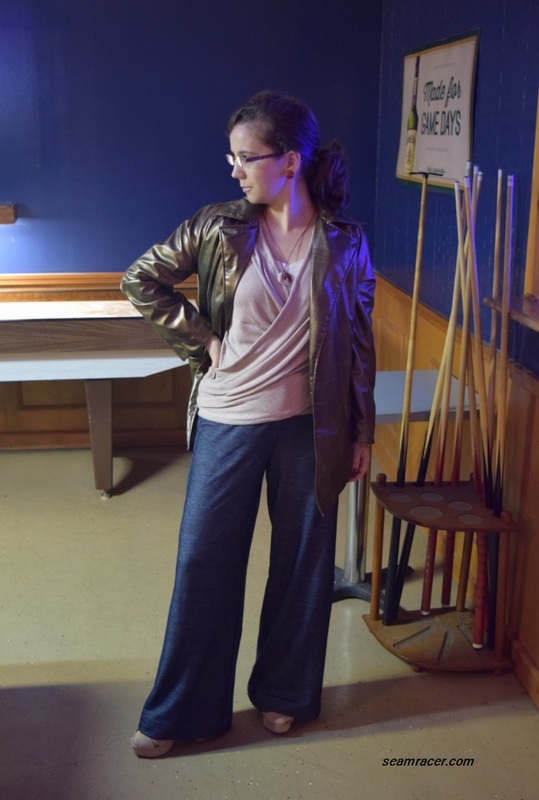 Now I’m glad I never sewed it up into a dress like I had originally planned because these 70’s pants are way hotter…oh, and comfy. 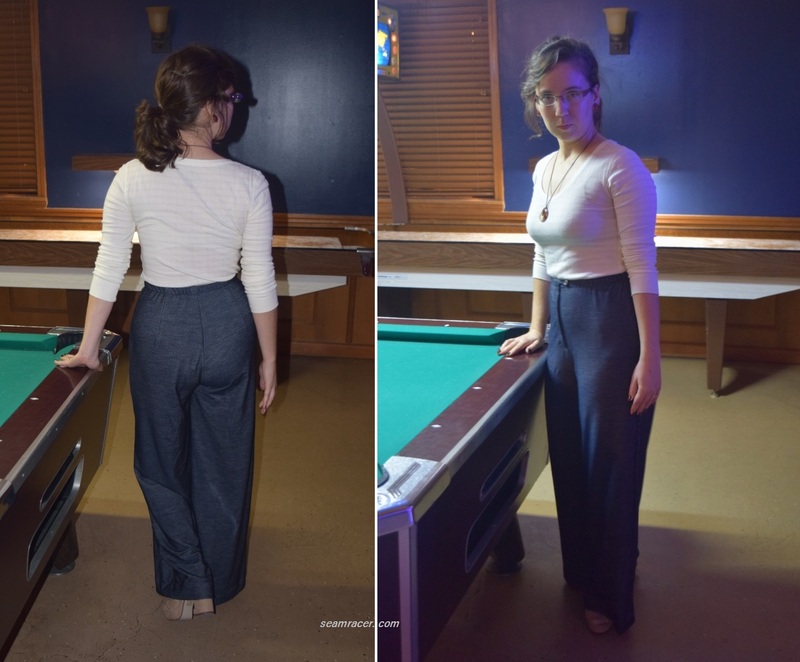 Everything I love about vintage 1940’s trousers is combined with my love for the 70’s here – full and wide legs, true waist, chic styling, and perfect fit. Add on a body skimming booty and less excess fabric around the thighs and welcome to the disco era. My favorite part is the lack of both the conventional waistband and the front placket here, replaced with a simple loop and button above the zipper. It makes for a very clean look that’s so easy. 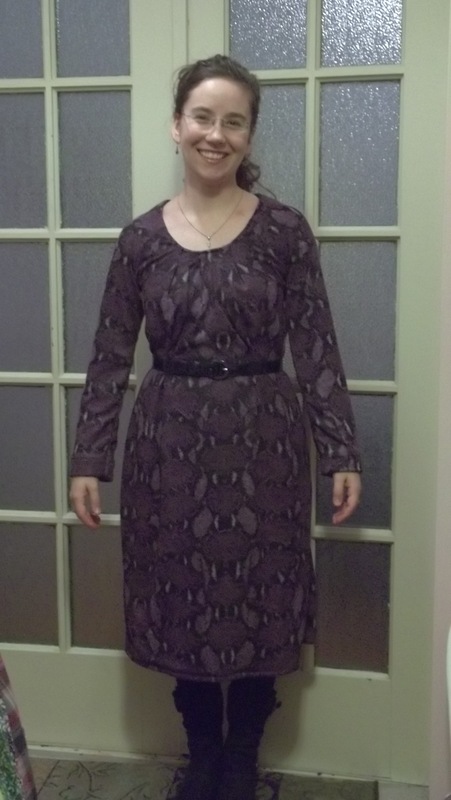 The instructions showed to sew in a ribbon waist, but I used some wide non-roll navy elastic instead and I think this turns out much better and is a better (and more forgiving) fit. The best part? 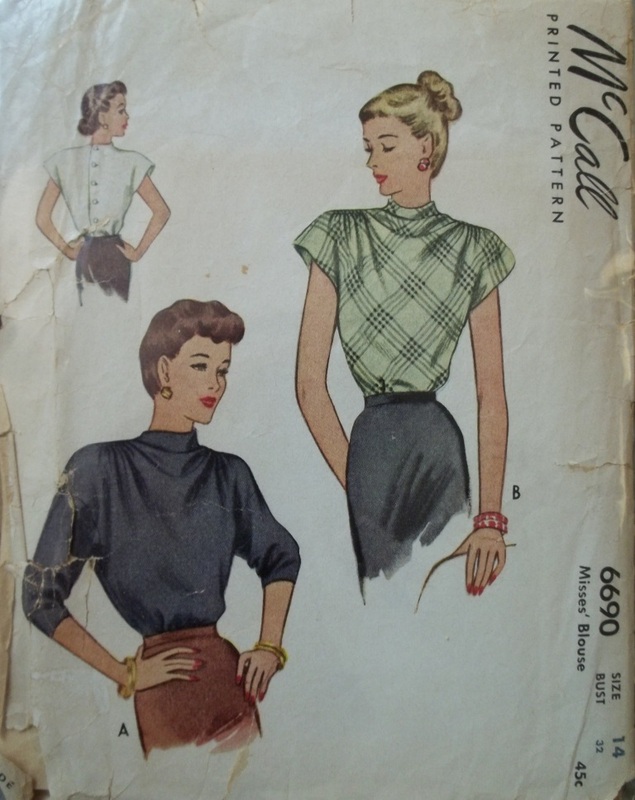 These pants are a perfect fit for me without a hair’s breadth of change…go vintage patterns! These pants make me feel very tall, skinny, and all legs. This was the 70s ideal body type anyway, and I like the feeling because in reality I normally think of myself as short, not skinny enough, and definitely not very leggy. I kept a very long hem on my pants so as to wear my new 4 inch platform strappy heels. 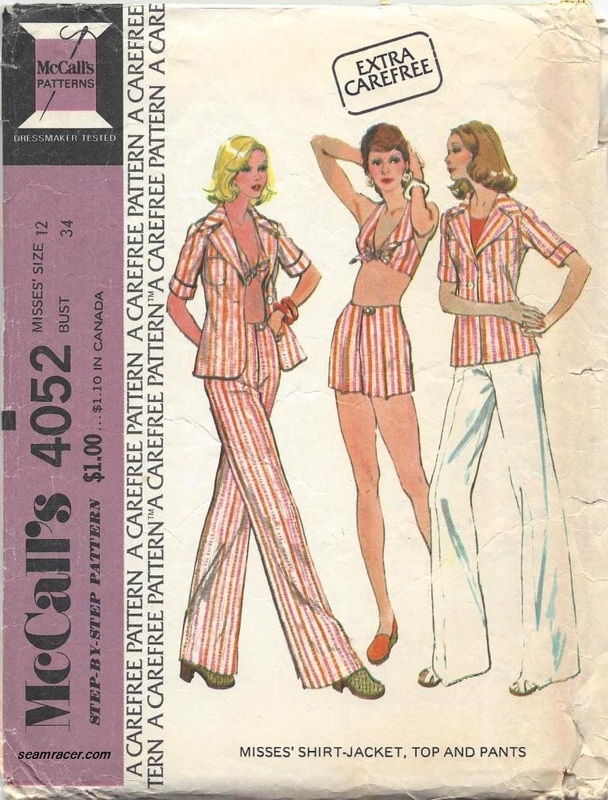 After making year 1974 pants, I remembered a project waiting in the wings downstairs for the last several years. 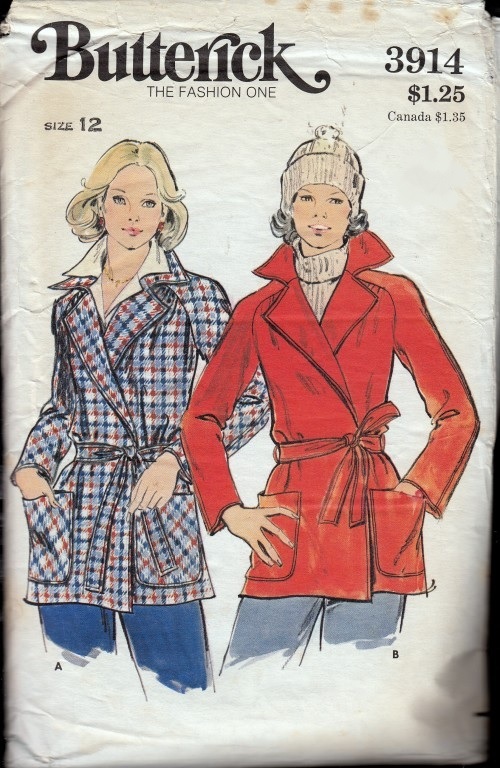 This, together with the thought of another cozy layer to add to the 70s gloriousness, and I reached for the jacket project. This was rather an exhausting project that I don’t know I was ready for, but it should see much use in the next few months, starting immediately. 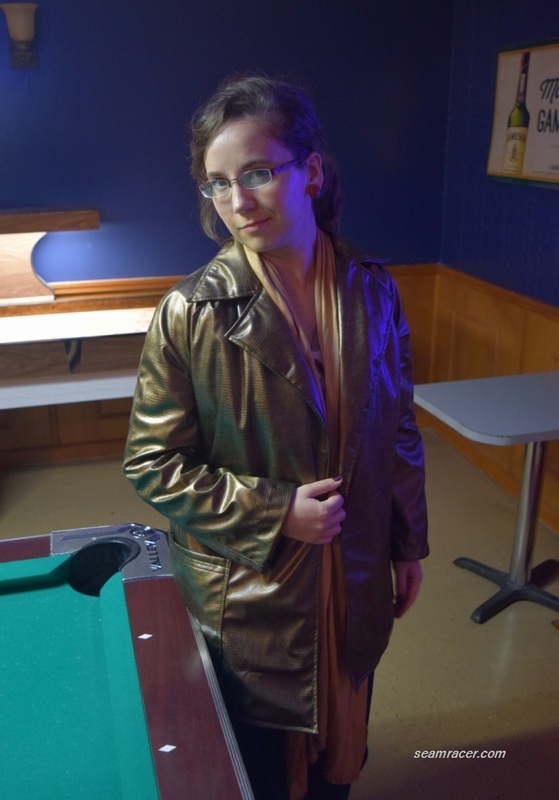 There are some things I wish I could have made to work out better, but I am just proud at my first official coat and my first sewing with this kind of vinyl. I do love the slightly golden sheen to the snakeskin print and the waterproof protection without looking (and sounding) like a plastic raincoat. 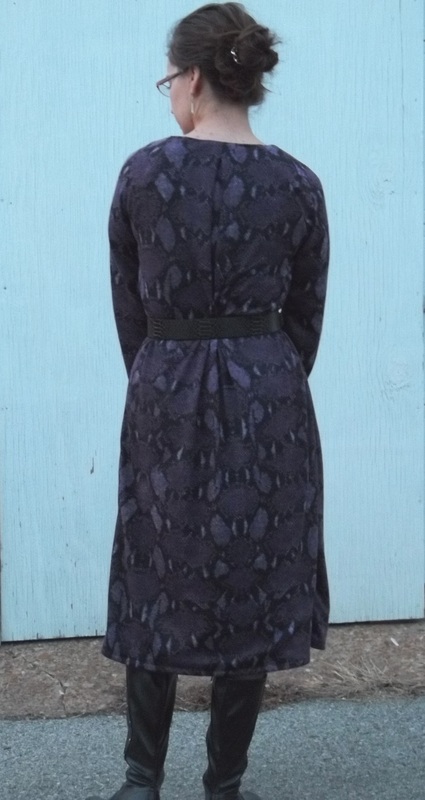 The most stressful part of sewing this coat was the thought that I only had one shot to get things right…unpicking and re-stitching wasn’t really possible here because once a hole is made, it’s permanently going to be there. Also, the vinyl was sticking to all the metal parts of my machine so I had to sandwich a layer of wax paper around the coat’s seams at almost every stitch so it would glide under the presser foot. This wax paper method worked like a charm, and was easy to take off, it just was something else to add to the difficulty level. So, in total not only did my stitching have to be accurate, and I was limited to my use of pins for seams (reverting to clothes pins), but I had to sew between wax paper. This coat must have given me at least one grey hair. 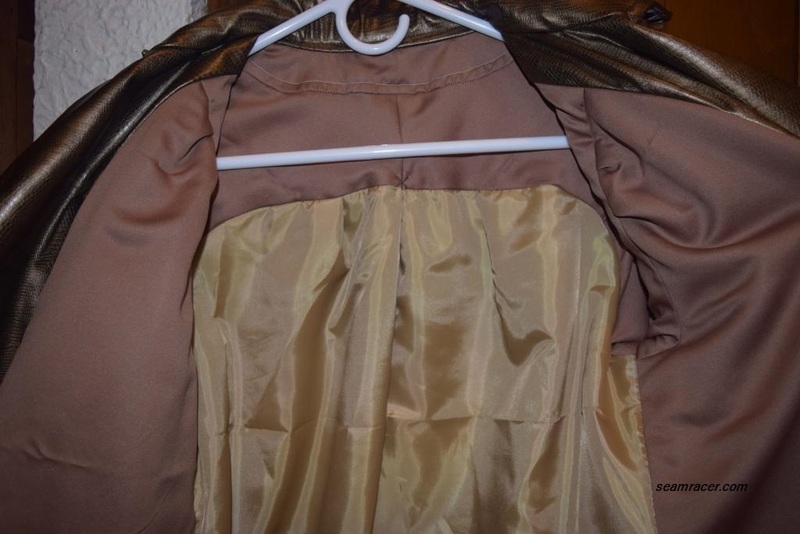 My only change was that in lieu of gathers under both the front and the back yokes, I made my own pleats – two ½ inch ones on each front and one giant box pleat down the center back. My two giant pockets are lined in a remnant of a 1970’s curtain which I had on hand from a buying someone’s small fabric stash at re-sale store. It was so bold and fun, I also added bright green bias tape to finish in inner edge. No one will ever really know it’s there, but I like how the print makes me smile whenever I see the funky brightness inside my pockets. I still don’t know how to close the coat – any suggestions? I don’t like it belted and it is warm enough that a little air actually feels good. I’m beginning to think I should just leave it open and casual. 1974 is an interesting year for me to channel. My dad graduated that year from high school and (among other things that happened) he became a lover of the pinball machine. 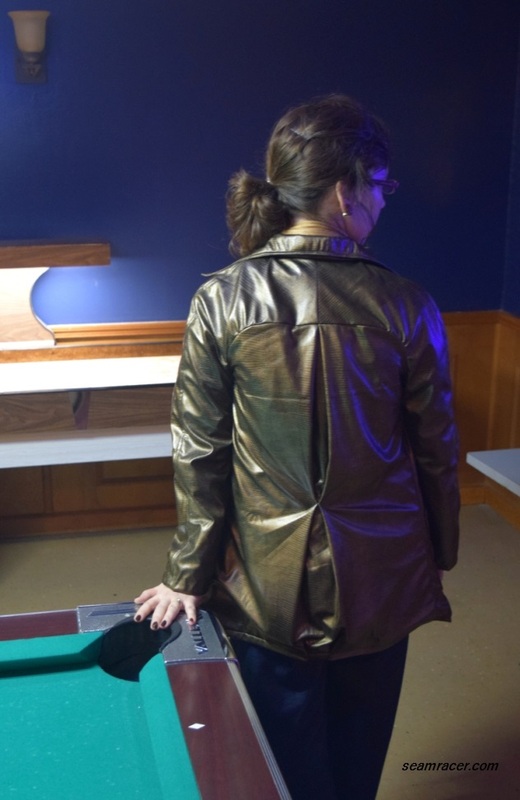 Every chance we could as I was growing up, my dad and I would hover over and eye up every pinball machine, with the occasional dropping of a quarter to do a real play. I always saw my dad as a champ at the game and he still enjoys playing when he can. 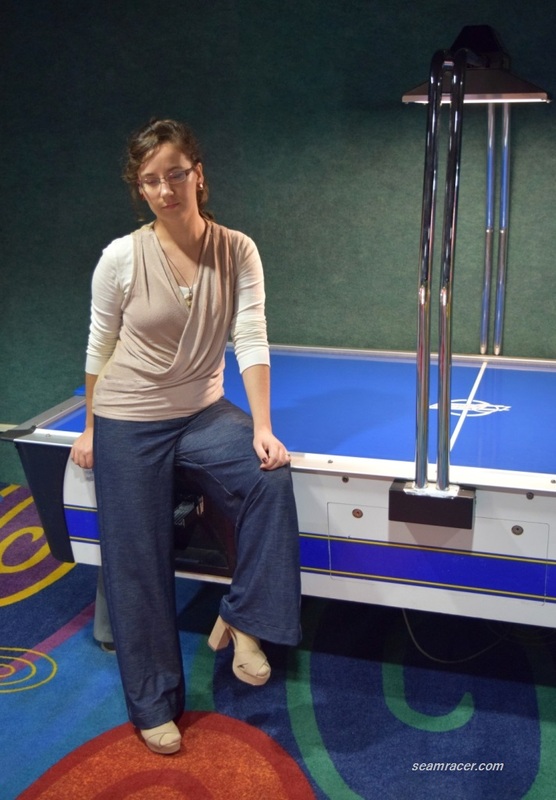 Luckily there are some game lounges around in our town nowadays that are much more respectable than those of the pinball culture 40 years back. 1974 was also the year the California Supreme Court ruled that pinball was more a game of skill than one of chance and overturned its long prohibition, opening the way for general acceptance of this form of amusement nationwide (info from here). So much of this outfit is due to the influence of my dad. He still has some of his 70’s bell bottoms, though he got rid of his platform shoes, trench jacket, and elephant pants years back. Now his daughter has her own version of what he used to wear, sorry dad! 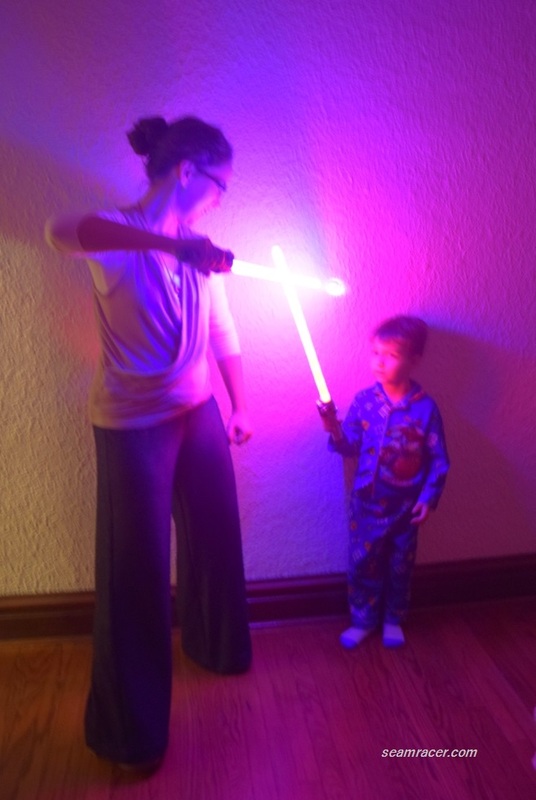 He loved Star Wars and bought me many of the toys and even watched the movies from the roof of their house on the drive-in screen which had been up the street. The apple doesn’t fall far from the tree I guess. Star Wars is still around on screen, and the 70’s style is coming back today, and retro amusements are just as fun, so it’s hard to resist re-visiting my dad’s past with my own handmade twist. This one’s for you, dad, hope you don’t shake your head at this…just smile. I guess the name for this creation of mine is rather self-explanatory. 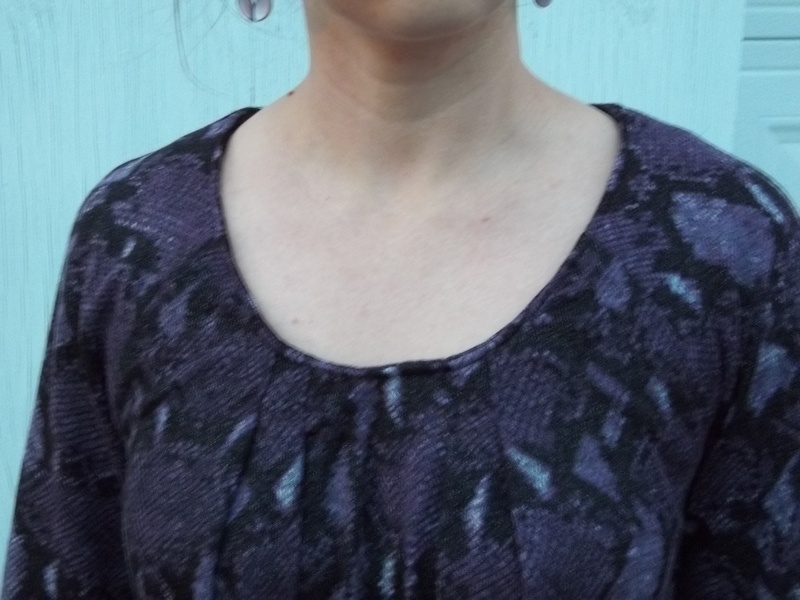 I used two of my hubby’s unwanted, gi-normous size sweaters to make myself a new cozy sweater dress. The completion of this project is a personal achievement because I didn’t use a pattern, even though this posting is way overdue as it is a project made 3 years back from now. I just made everything up as I went along, knowing by now how patterns tend to go, and tried my dress on a million times in between in order to get things to fit right. 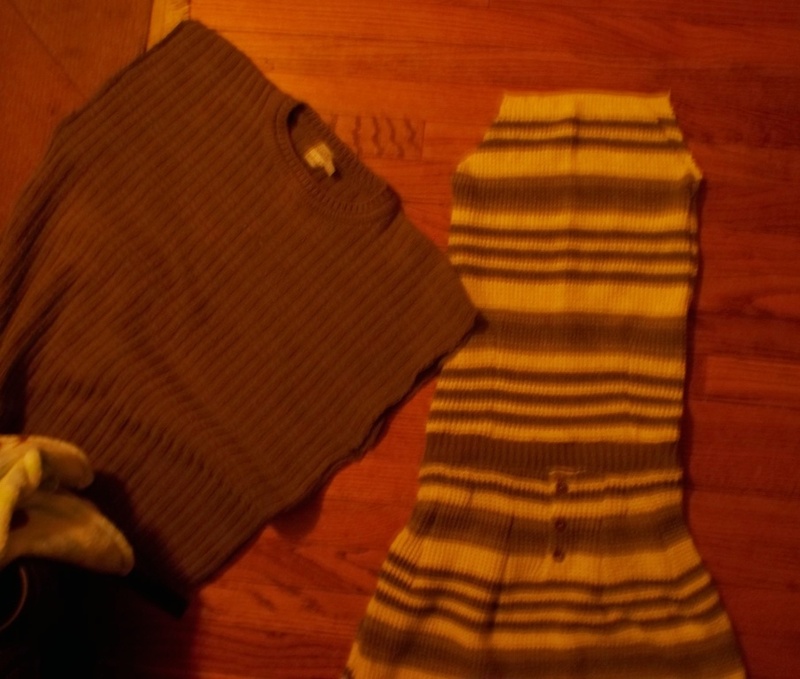 FABRIC: Two of my husband’s outdated, out-of-shape 100% cotton pullover sweaters; one striped and one waffle/cross-hatched knit, but both had similar colors. 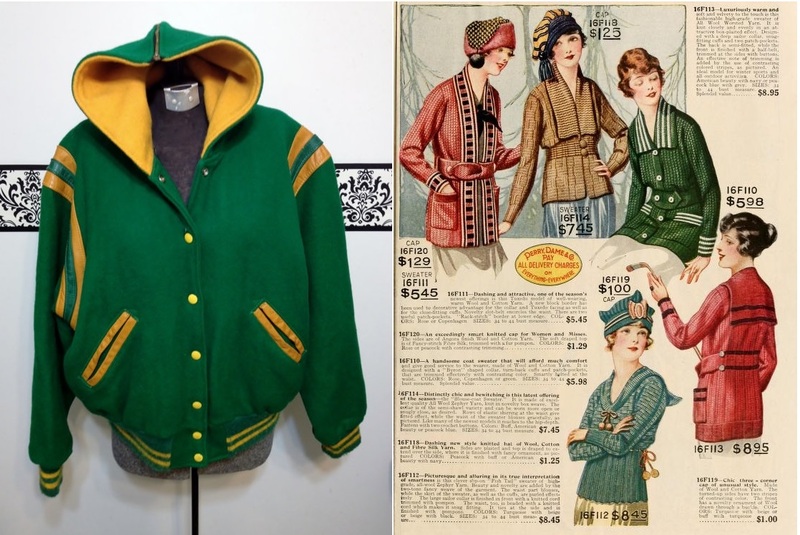 The labels on the sweaters carried the name of a privately named “design group”, below which it said that they were “Made in the USA”. See pictures lower down. NOTIONS: none were bought, as I already had the thread and clear elastic that I needed. PATTERN: none – a big fat zero! THE INSIDES: The inner raw edges are merely together with a double stitched zig zag finish, same as for the seams themselves. 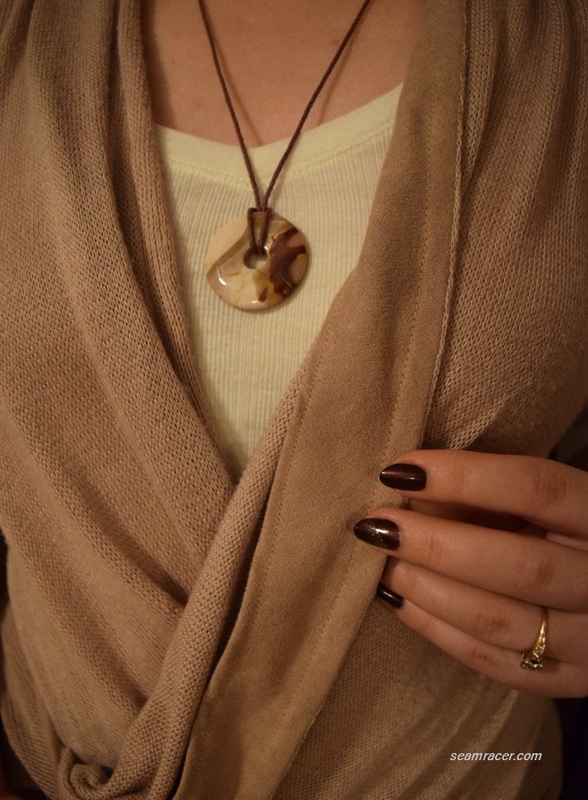 This is not my preferred finish for the edges, for they still ravel constantly, but the sweater knit is so very thick, a zig zag finish is all my machine would nicely handle. TIME TO COMPLETE: Over the course of a week, I worked off and on for an hour here, two hours there, and was finished on January 19, 2013. FIRST WORN: to our town’s yearly “Auto Show” convention. This project so nearly became a UFO at several intervals between starting from scratch and achieving a nicely finished dress. It was one of those things where I throw it in a huff, at my wit’s end, out of ideas, and disgusted with the garment as I saw it at the time. Only an interval of time would give me the time to cool down and come up with a new idea of how to make things better. Then the knitted beast would get brought back out from the spot where I “buried” it and get tweaked again. I’m normally a very patient seamstress, it’s just UFOs and re-fashions can be difficult and challenging…they’re like pioneering out on one’s own, not knowing how things will go and where they’ll end up. Nevertheless, that’s the fun and the pride of the whole thing, especially when it’s finished satisfactorily. It’s always going to be hard to make something lively and spiffy out of something very unexciting and unwanted – silver linings can be quite clouded. The two sweaters matched so well together and I do love a challenge, so I took this project up. My skills have come a long way since making this sweater re-fashion, but I really don’t look down on this. I absolutely love the design I made and the fit is great. My only beef with this dress is the stitching I did, which is loose in several rows of zig-zag stitching, and the messy looking insides. However, every time I think of my dual reservations, I really can’t think of a way I could have done it better now, so I fault the fabric. Really the fabric was highly resistant to being sewn on like a temperamental child. I tried several different needles – knit, woven, and heavy-duty – and none of them easily went through the knit. 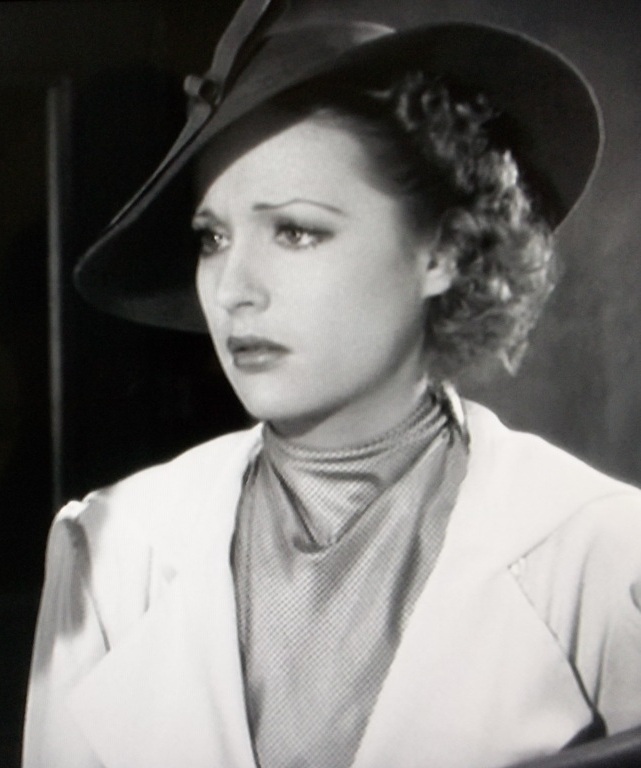 All the needles would land heavily on a strand of knit and not go through…augh! This is the major reason I couldn’t get a tighter stitching to work. The stitching is tight enough to keep it together but loose enough to still stretch with the knit. I did do something which I see on RTW garments – clear elastic sewn into the seams. Added into the shoulder and side seams, the elastic gives me peace of mind that my dress will keep some sort of decent shape, at least the shape I intended for it when I re-fashioned it. After all, if the two sweaters stretched out for my hubby before their re-fashion after years of washing and wearing, I expect this difficult sweater knit to possibly continue to give me the same trouble. Even if it does eventually get wonky on me it was great while it lasted for its second life. 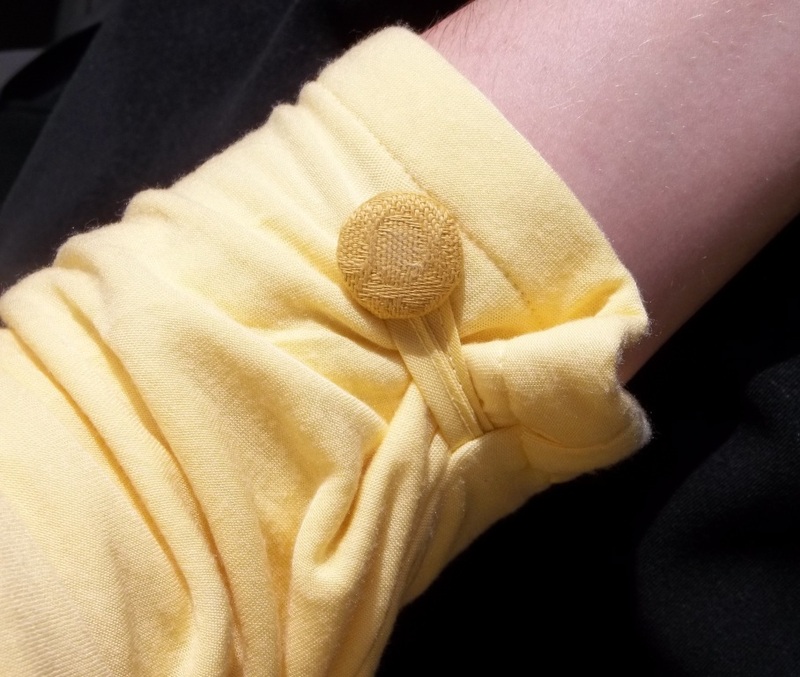 was re-used as my neckline, as well as the sleeves, granted that they were re-cut into a new shape, with the wrist cuff as the new “end” the my short sleeve. 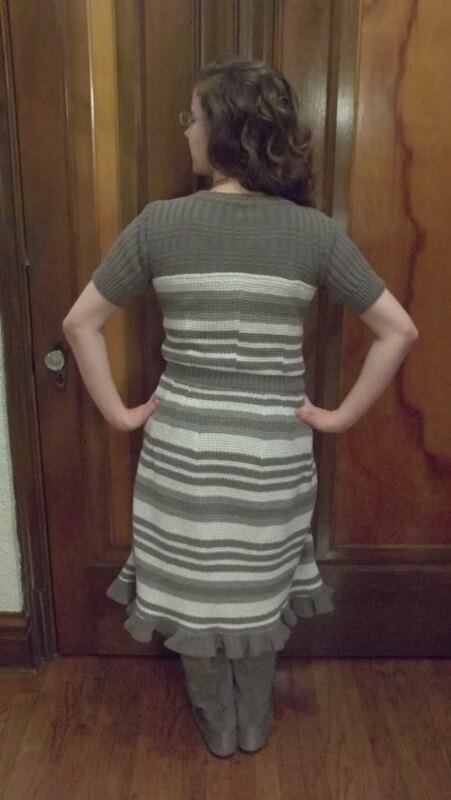 My dress’ waistband is actually the bottom band of the solid sweater, too. Wide strips from out the main body of the solid sweater were hemmed and gathered as best they could to form the bottom ruffle. Darts were sewn in all across the waistline both in the bodice and skirt portions to smoothly shape this dress. Sorry for low picture quality here. It was a late night pic. “How do I make some chunky drab sweaters look fashionable and appealing?” This was my dilemma at the outset. My original idea was something very similar to what my final dress is like, which was inspired by perusing internet images of patterns (especially Colette’s “Macaron”) and dresses involving two complimenting fabrics. It’s only when I started sewing that I strayed a bit and came full circle. As I was making the dress, I even had the wild idea to keep it strapless, or almost so with skinny straps, and use the solid sweater to make a little bolero waist-length cover-up, or at least a top to go over the dress. Though the idea sounded fun, this re-fashion was challenging enough and I didn’t want to try too hard on something complicated that might not work and end up wasting the fabric. So I stuck with something easy, one piece, and semi-predictable – like a dress. I’m happy I stuck with my gut instinct. 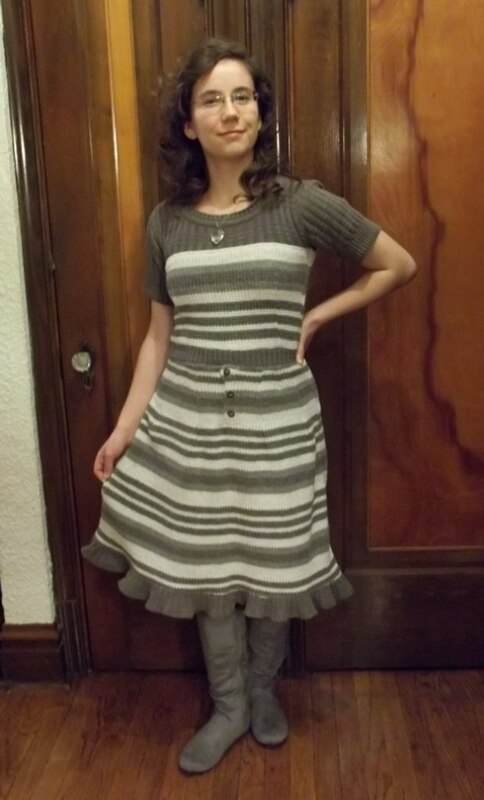 I love the mix of textures and patterns and features to my re-fashioned sweater dress – cross-hatched knit, waffle knit, stripes, ruffles and such! The bottom ruffle was the last thing I added, but I love how it saves the dress from being what I thought was slightly boring otherwise, with just the right hint of fun girly flair. 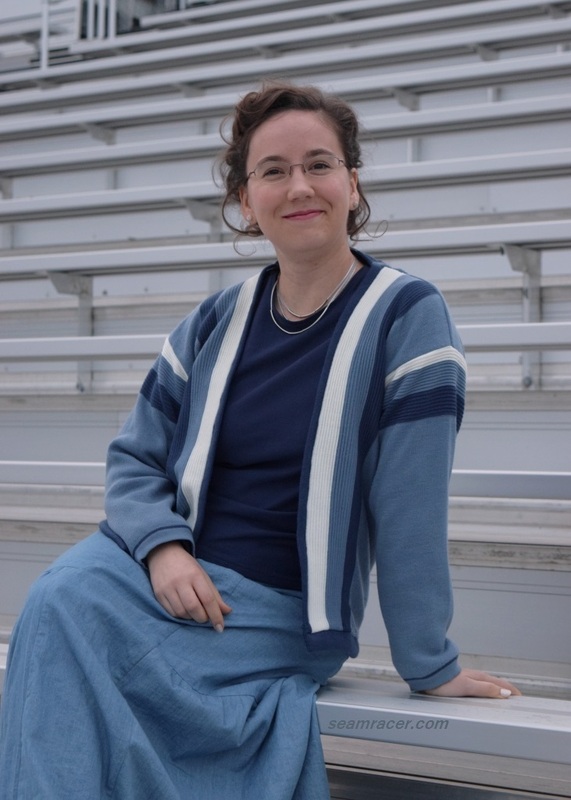 The ruffle also complete the color pattern – solid at the top, solid in the middle, solid at the bottom, albeit different forms of the same color at each spot. The waist being made from the sweater’s bottom band makes it a bit more supportive, and decorative, than if I would have used a section from the rest of the sweater. 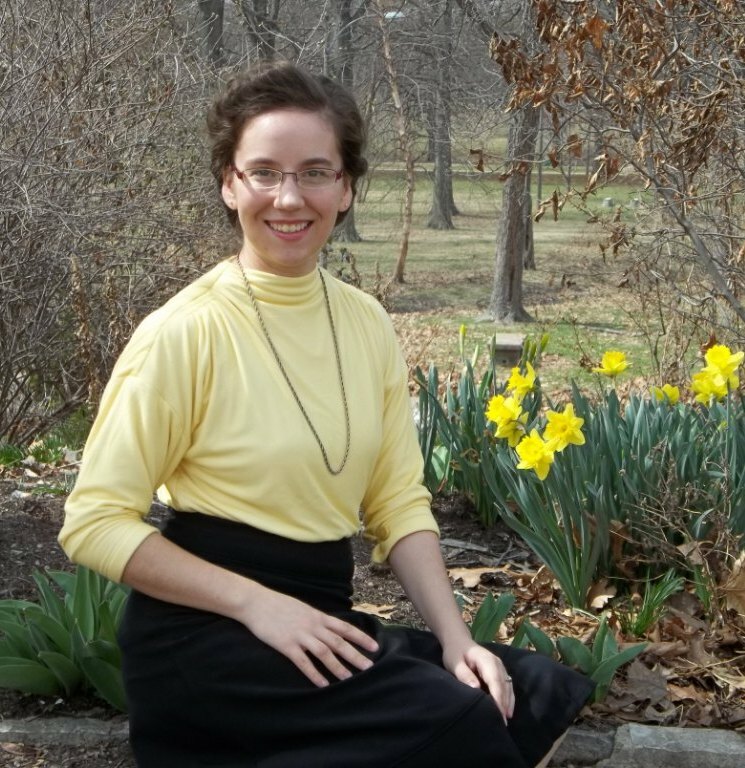 And just because I can, I kept the three button neckline closure on the striped sweater and placed it as a sort of ‘fly’ below the front waist of my dress’ skirt. I love to make my garment special and unique, but this one has a quirky personality. Trying out a monster motorcycle! My “husband’s sweaters” dress is the perfect garment for just plain wearing of course, but more specifically, 1.) when I want to feel very warm and cozy, 2.) when at an occasion where I’m going in and out of stores, where it’s warm inside, between walking around for some distance outside, where it’s very cold. The second specific reason is the case at many “holiday walks” in December at some of the old sections of town or out-of-town. 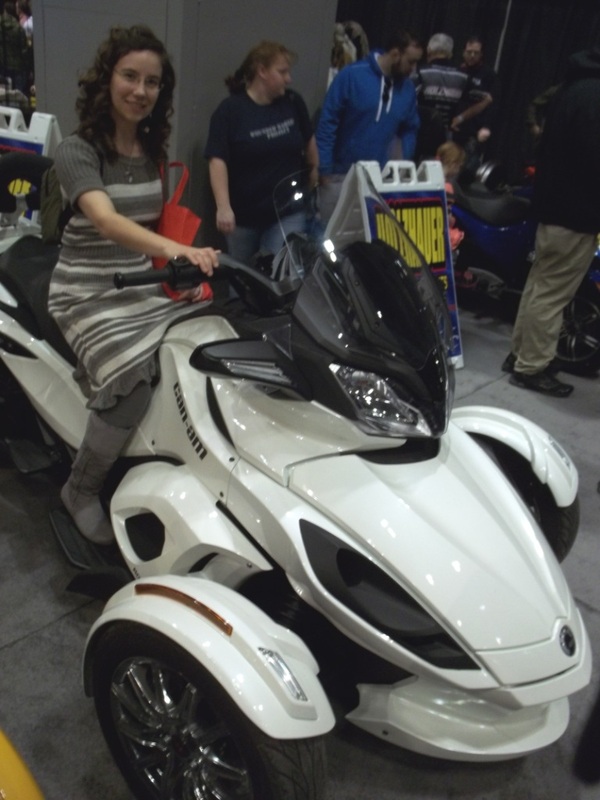 It was also the case for the car show – we had to park a long walk away, so I needed to be warm, but be comfy inside too. I am the type of person that detests the cold, especially bitter temperatures, and loves warm climates. 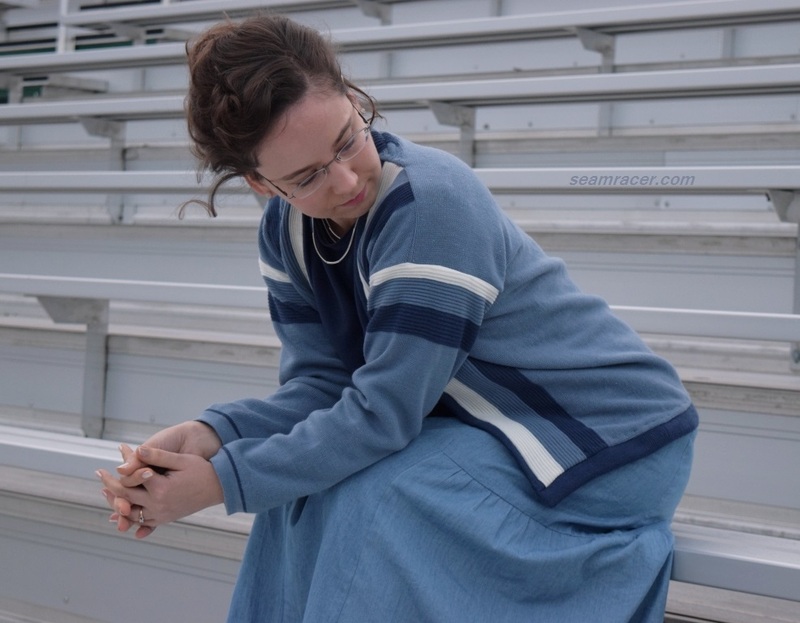 That being said, I also cannot stand being overheated in some bulky winter clothes – I feel as will melt…in my mind if I’m going to be hot give me warm weather and a sundress! 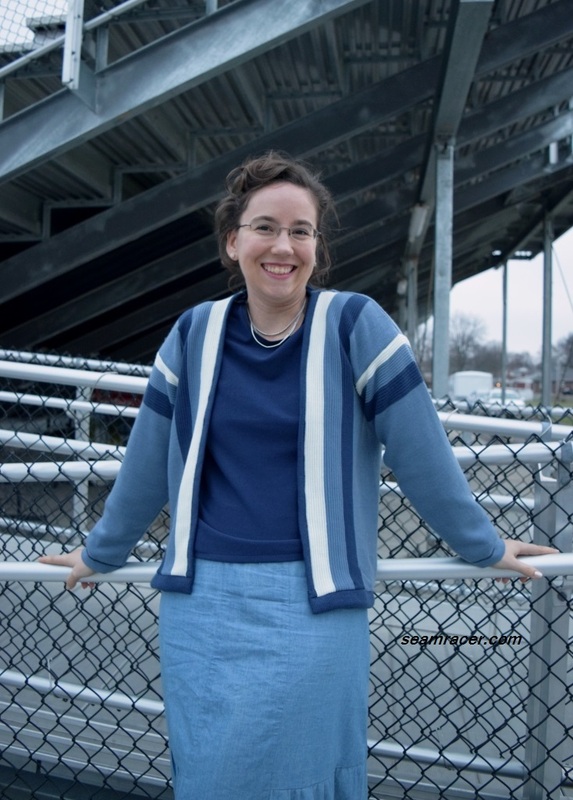 The short sleeves, loose knit, and cotton content makes this sweater dress perfect for me…one of the reasons I re-fashioned it! 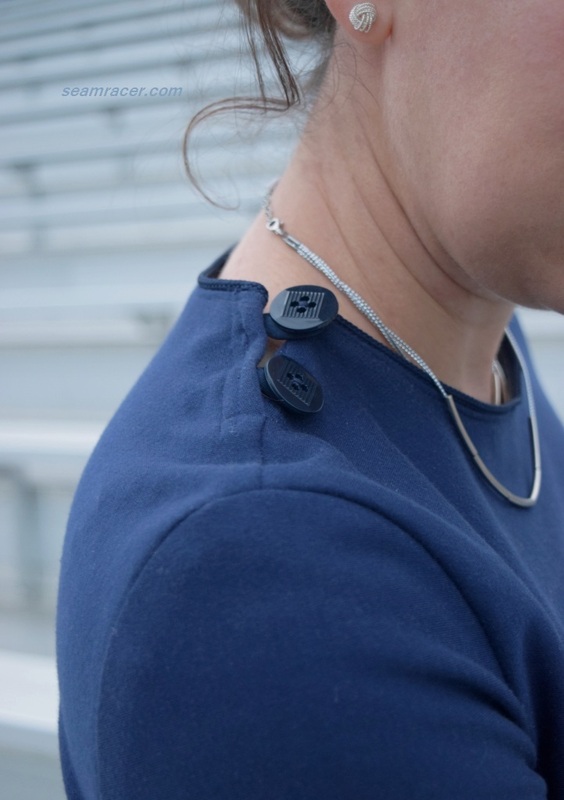 Clothes can be utilitarian because they are a basic necessity – matter-of -fact truth. They also can be a work of art. They can be a morale booster. They can be a source of satisfying a desire to create or an enjoyable hobby. Yes, they can also be a bad tendency or a drain or an income, too. Either way, I think there is too much out there to buy on the cheap which is not really “you” and easily forgotten. 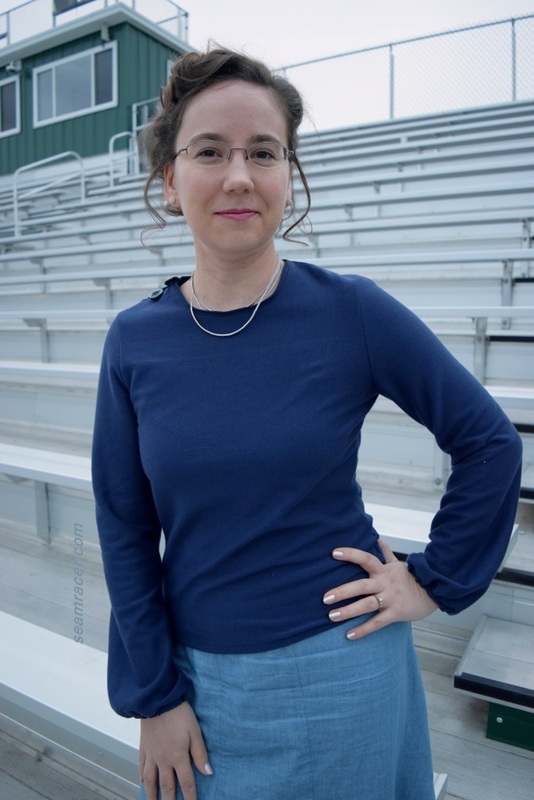 Most RTW is of low quality, not doing good any way you look at them – whether for the workers that make them, the environment, and especially for the wearers. 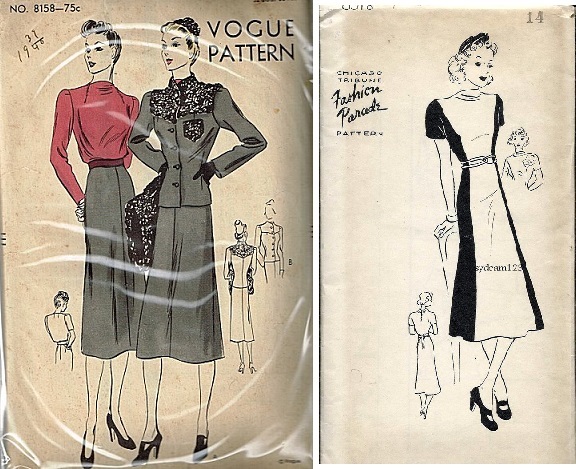 Sewing your own garments the way you want them and exactly for your body ends this current fast fashion habit, and helps minimize the vicious circle going on unheeded, and really does so much more good all around – particularly for YOU! 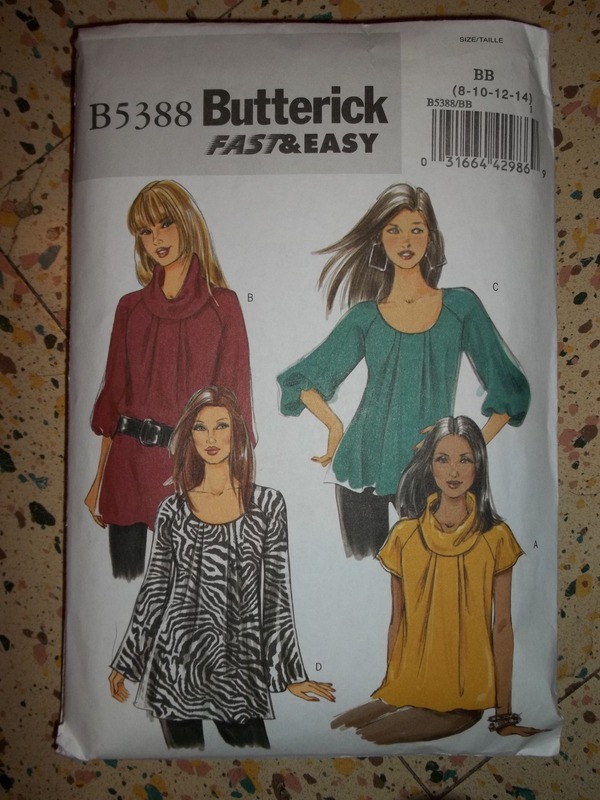 Do you re-fashion garments for yourself or do you find it something alien to not sew from scratch? 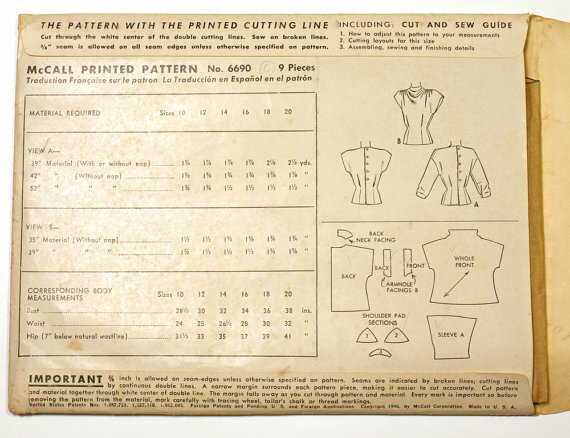 How do you feel the most strongly about your sewing?